In 1-quart saucepan, mix all topping ingredients except bananas. Heat to boiling over medium heat, stirring occasionally; remove from heat. Gently stir in bananas until well coated; keep warm. Heat griddle or skillet over medium-high heat or electric griddle to 375°F. Grease griddle with cooking spray, vegetable oil or shortening. In medium bowl, beat egg with wire whisk or hand beater until foamy. Beat in milk and butter until smooth. Stir in remaining pancake ingredients until blended. For each pancake, pour scant 1/4 cup batter onto hot griddle. Cook about 1 1/2 minutes or until pancakes are puffed. Turn and cook other sides until golden brown and dry around edges. 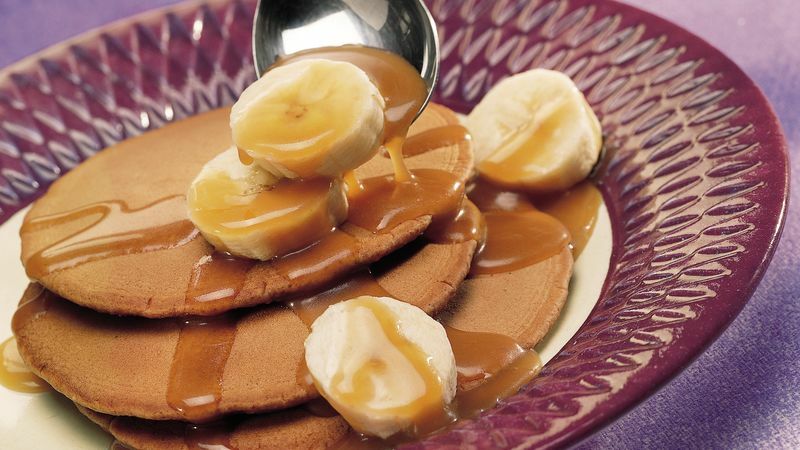 Serve pancakes with topping. No time to make the topping? Go ahead and slice 3 bananas into 2/3 cup warm caramel topping.